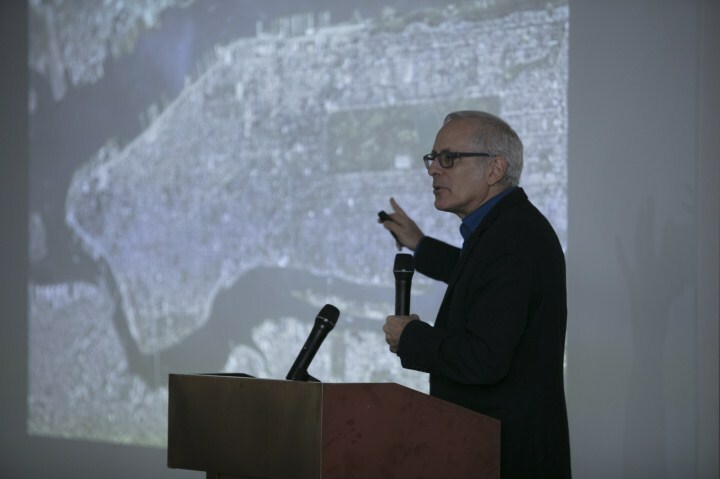 Harvard architecture professor Preston Scott Cohen gave a talk at the Harvard Graduate School of Design Shenzhen Forum at Artist Is Present in OCT-LOFT last week. He stressed the importance of interior architectural concepts of space for the design of exterior pedestrian spaces. “The idea is to attract people to take comfort in outdoor spaces by imbuing them with the characteristics of interior rooms and corridors. As a result, the demand for large enclosed public spaces will be reduced, bringing more green pedestrian areas to the city and diminishing the need for automobiles,” he said. Cohen took the development of New York City (NYC) as an example for sustainable cities. He said that the grid of Manhattan was developed in the 19th century as a means to allocate development with the highest degree of flexibility and economic productivity, and Central Park is an “urban room” filled with nature and recreation in a city otherwise dense with business and residential neighborhoods. According to Cohen, elevated parks and open air arcades will be important for the future of sustainable cities. He then cited the High Line and the Goldman Sachs Arcade in NYC as examples. High Line Park (2010) was built on a defunct elevated train bed that snakes through the Lower West Side of Manhattan. The idea was conceived by neighborhood activists who appreciated the old rail line and natural weeds. Later architects added ornamental features such as smooth concrete planks and benches that weave through the train tracks and planting beds. Goldman Sachs Arcade (2012) is an angular glass canopy over a prominent pedestrian passage through the mixed-use district. Shading and natural breezes cool the space, creating a popular retail, leisure and resting place for the public. “The two new recently completed projects in NYC demonstrate the role that innovative architectural design can play in the transformation of the city into a low carbon, increasingly green and pedestrian environment,” he said.